Sew Krazy Craft of the Week! Join us live at 10pm EST with special guest Michele McGraw @scrappinmichele! We’ll be talking tags! Gift tags… scrapbook journal tags… and handmade tags! I’m featuring one of the supplies used tonight in my OpenSky shop. It’s Chronicle Books Crafty Stickers. This little book of labels can be used for way more than just paper crafts! I can’t wait to do a demo tonight. Tonight on Sew Krazy: Craft All Day! Join me tonight as I gather around the crafting table with my little girls, Allison (4) and Rachel (5). We will be sharing one of our favorite boredom busting activities… The Craft All Day Giant Bucket of Fun! This bucket of random craft items was one of the best kid craft purchases I’ve ever made. It has all the things you’d think of… like popsicle sticks, feathers, googly eyes, and pipe cleaners. But it has even more than that… crepe paper, assorted ribbon, doilies, and pom poms. It even comes with crayons and glue sticks! I’ve not even listed half of what’s in this giant bucket of fun! The girls have been dying to get on camera with me. To be honest… I haven’t had a show recently that they could truly be a part of. So grab your little ones… some glue sticks, feathers, googly eyes, and other random objects and join us! Sew Krazy will air live tonight (Monday) at 10pm EST on MomTv. 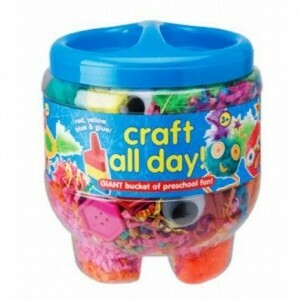 If you would like to purchase your very own Craft All Day Giant Bucket of Fun… It can be found in my OpenSky shop! I will never carry products in my OpenSky shop that I’ve not tried and loved myself. So have a ball!